In the words of Albert Tenuta, crop disease specialist with the Ontario Ministry of Agriculture, Food and Rural Affairs, "Stresses that contribute to an increase in stalk rot infection include: a) moisture stress (lack of or excess water); b) leaf diseases (rust, Stewart's wilt, etc. ); c) leaf and ear damage (hail, birds, frost, etc. ); and d) insect damage (corn borer)." These stresses are largely controlled by weather factors, but there are others. Two additional factors that could have led to the problem are potassium (K) and chloride (Cl) - two critical nutrients affecting the incidence of stalk rot. If you notice excessive lodging while harvesting this fall, it's too late to do much about it - for this year's crop. But it's not too late to diagnose prevention for next year. Potassium has long been the nutrient most associated with plant disease reduction. It has been shown to reduce stalk rots caused by Fusarium moniliforme, Gibberella zeae, and Diplodia zeae, in research reports from the period 1960 to 1977. An Illinois study showed the benefits of K fertilization in a crop fertilized with high rates of nitrogen (see Table 1). The soil test for K was high in this study. Table 1. Potassium fertilization effects on corn in Illinois. Chloride also has a role in reducing stalk rot. Recent research on maximum yield systems in New Jersey (Heckman, 1995) confirmed that fact in a maximum yield experiment with high rates of muriate of potash (KCl). Data are shown in Table 2. For more information, see Better Crops Vol. 80(2):14-15. Rates of chloride need not be as high as in this study. The amount supplied by muriate of potash at normal rates of K fertilization is likely sufficient. Table 2. Effect of chloride fertilization, mean of 4 years (1991-1995). In fact, such findings on chloride are not new. As long ago as 1958, chloride was also found to reduce stalk rot in New York state, as reported by Younts and Musgrave. Many corn growers use liquid starters, for their benefit in efficient delivery of phosphorus to the young seedling. However, less attention has been paid to the potassium and chloride supply in these liquid forms. Starters placed near the seed may often be low in chloride by choice: chloride sources have a higher salt index and thus greater risk of harming the seedling. But the crop may need more of both potassium AND chloride later in the season. Recent research in Ontario has confirmed an increased need for K in starters in no-till corn (see the Better Crops article by Dr. T.J. Vyn and others). Indeed, potash deficienciy symptoms were observed in many places across the Corn Belt during the 2000 growing season. starter fertilizer - does your starter supply both potassium and chloride? Heckman, JR. 1995. 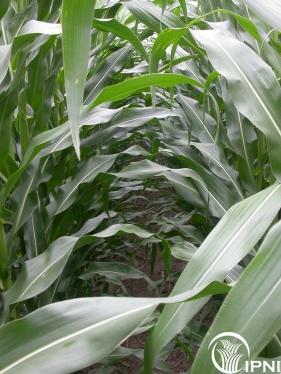 Corn responses to chloride in maximum yield research. Agron. J. 87:415-419. Younts SE and Musgrave RB. 1958. Chemical composition, nutrient absorption and stalk rot incidence of corn as affected by chloride in potassium fertilizer. Agron. J. 50:426-429.